I have collected a few recent examples from online communication after some online purchases. 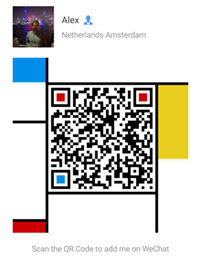 Examples are mostly in Dutch. But I will explain the pro's and con's in English. 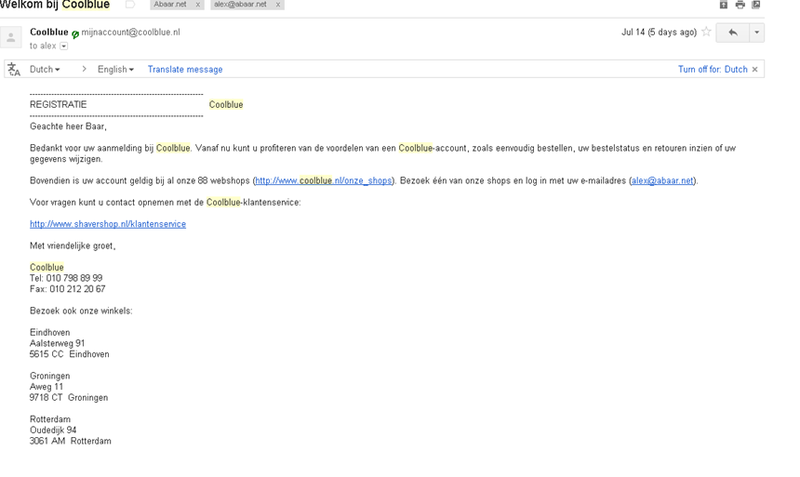 Still I think (and I wrote about it here as well) that companies can improve their (online) communication so much more. Good communication and service goes beyond a "we recommend you" e-mail. Think about all customer touchpoints, about your vision and mission and create contact moments that in the end will give you a positive ROI and customer experience that will be shared online massively. Especially (But not limited to) the travel industry can start much more effective campaigns by better segmentation and not placing every cross and upsell possibility in these one or two confirmation mails. Be there with the right content at the right time. Not everybody will book a hotel right away if they purchased a flight ticket for 5 months away! Value for the customer, value from the customer. Make sure you sent relevant and/or entertaining emails and you can earn money with it. If you are an airline, sent a few e-mails about the latest news at the destination (especially in vibrant areas), nice events, tourist info etc. If you sell dog food, you can also sent communication about dog tips, dog courses etc. 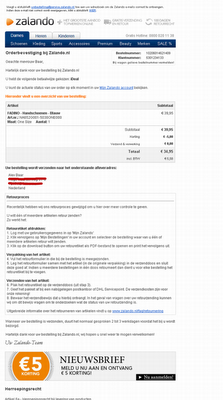 If you place an order where you choose to pay after receiving the goods (we still do not have an alipay in Holland where money is being hold in escrow untill the goods arrived in good order), bol.com try's to pursuade you doing a prepayment before the order reaches you. 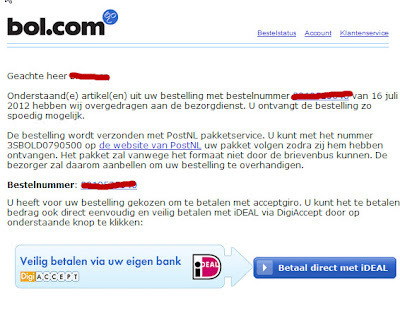 I think in this way they try to convince people who do not use or trust online payment methods to try it anyway. 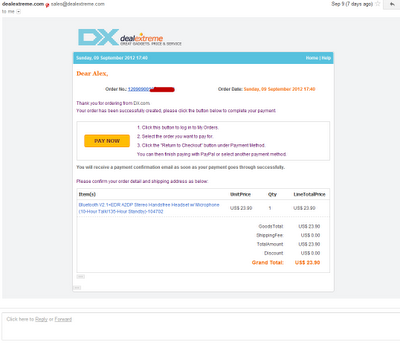 A suggestion would be to give a small discount then as well if the online payment method is used. The button at the right is the IDEAL online payment method. 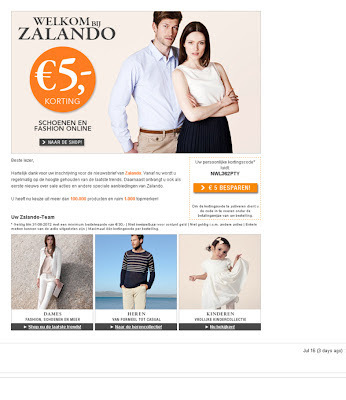 I ordered something at Zalando as well. 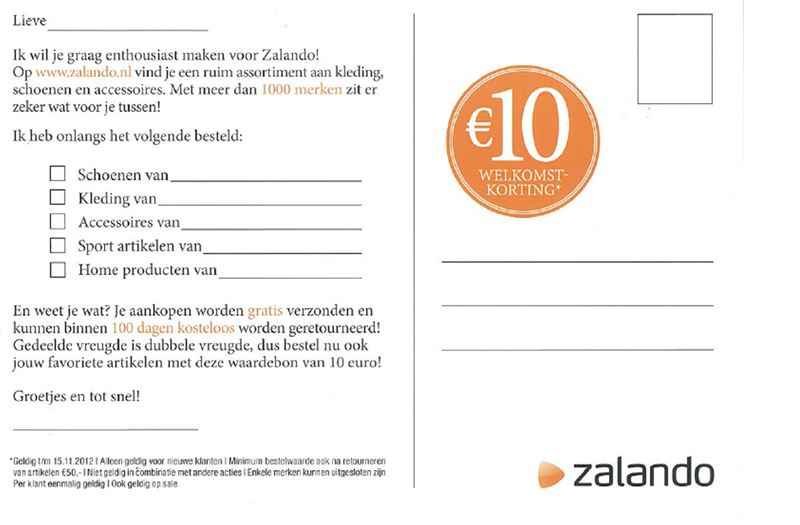 During the registration process (I did not completed the order yet), I read a message of a 5 euro discount when subscribing to the newsletter. So, I subscribed to their newsletter. This pursuaded me to place the order actually. This email will have a very high open ratio! 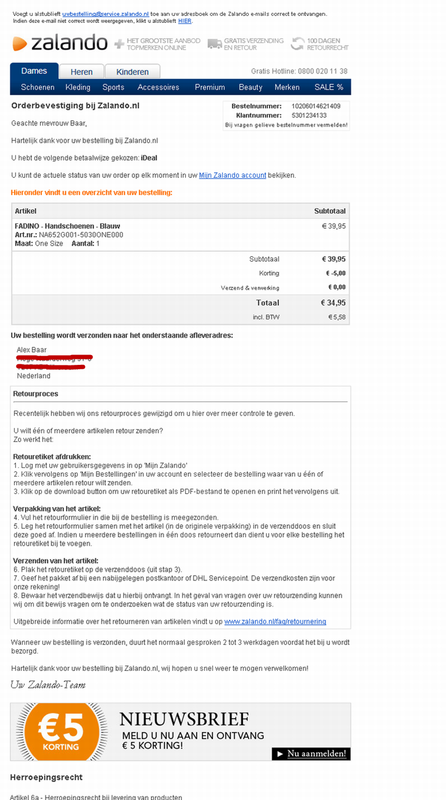 Well, finally I placed the order (with the discount of course) and I received the order confirmation. Usually the e-mail with the highest openratio. In this case maybe not, because this one also arrived in my spam folder. So they have to improve something there. No description of the next communication steps: for example "you will receive an e-mail when we ship your order"
No social sharing buttons. I would have liked to share this product at my social networks. The banner that says "5 euro reduction when you subscribe to the newsletter" is not necessary, since I just became a member. 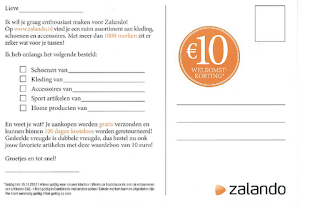 So this banner should not be there, but a banner like 'become a member of zalando lounge' or a voucher for my next purchase within 2 weeks or so. And then I received the shipment confirmation with track and trace information and what to do when the parcel has not arrived within 3 days. I would also expected to get a product review e-mail, but untill this moment of writing, I did not receive one. When the parcel arrived and I opened it, I saw they added to the parcel a print cart : their member get member programme. The cart is a little bit unclear, they can improve this and also by making the online version of a member get member promotion more prominent. 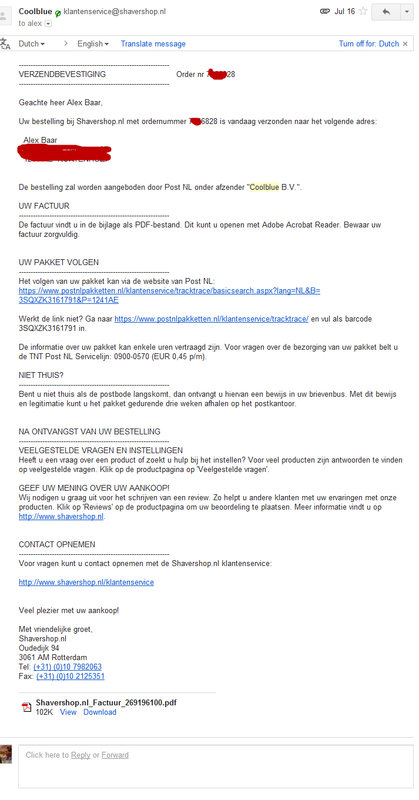 After about 1,5 week, I received an e-mail with personal recomendations based at my purchase behavior. Nice e-mail, but after one buy, they cannot tell so much, so I think it is better in this e-mail to ask the reader, for more personalisation. Ask for more info so you can personalise better. But the idea is good of course. Coolblue has a very simple registration confirmation e-mail. Plain text. This will always come through your spam folder. 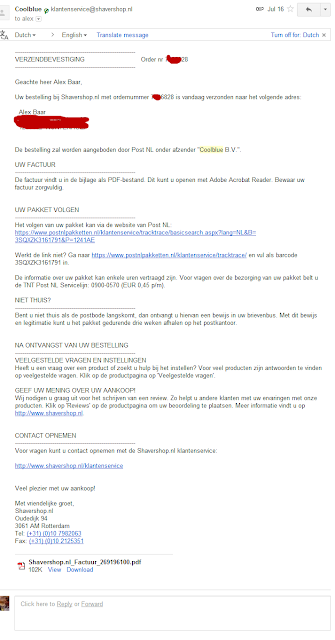 No upsell (but the reason might be that officially in Holland it is not allowed to make commercial offers in this e-mail if I am not also an hard opt-in , in their database). I forgot if I was subscribed to their newsletter when ordering. 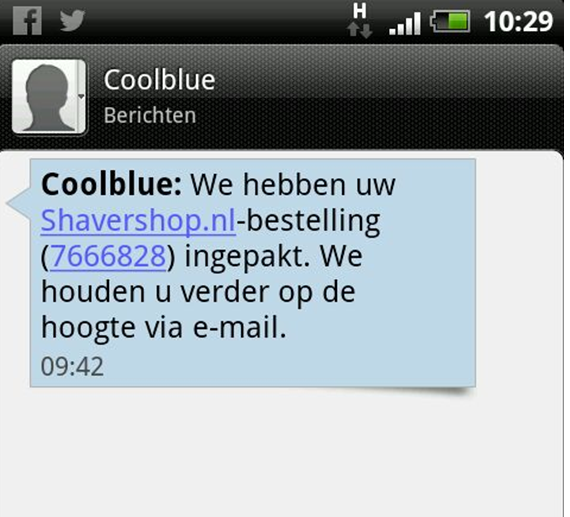 Suddenly I also received a text message at my cell phone from Coolblue, telling me that my parcel is ready to be transported and that further communication will go via e-mail. 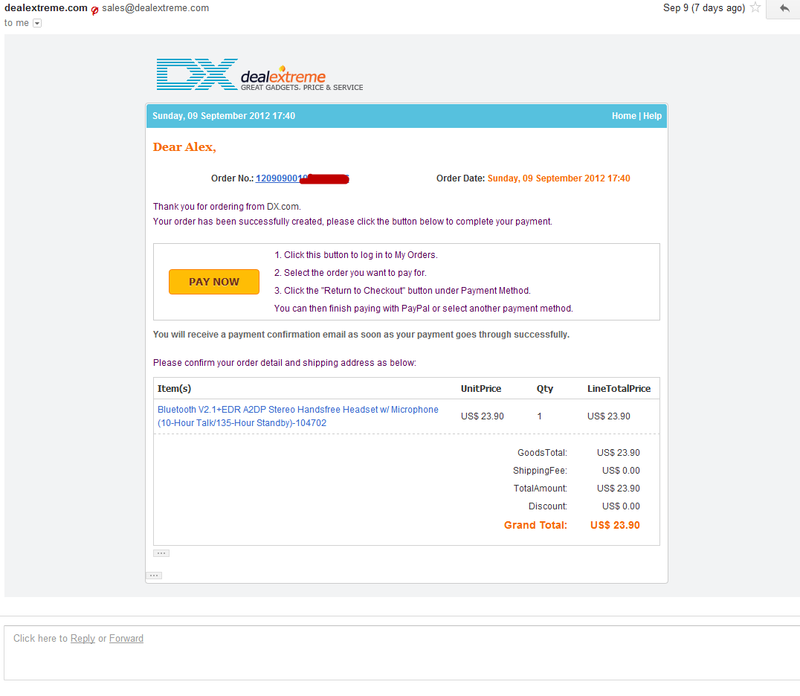 Then the order confirmation followed. Also a plain text e-mail. They communicate each time in communication the remaining part of the order process. The shipment confirmation came in via e-mail. 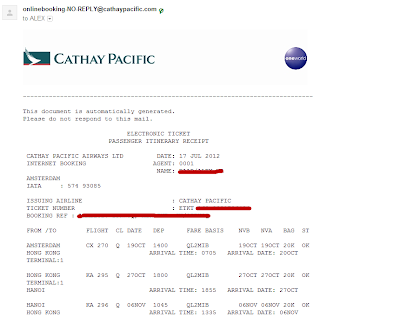 Jetstar Pacific, sends me a nicely designed e-mail after purchasing a ticket. But that's it. I have received no more communication afterwards. If they can differ if I am a business or leisure traveller, they can create nice contactmoments to try to sell me for example tourist excursions at my destination, hotels or other additional services. I am flying to HCMC, so sent me an e-mail with a nice video about the city, about some sightseeing spots and let me reserve a place in the excursions. Don't put everything you try to cross sell, in one confirmation e-mail. Try to get to know your customer and help him or her at his journey and try to sell at other touchpoints as well. 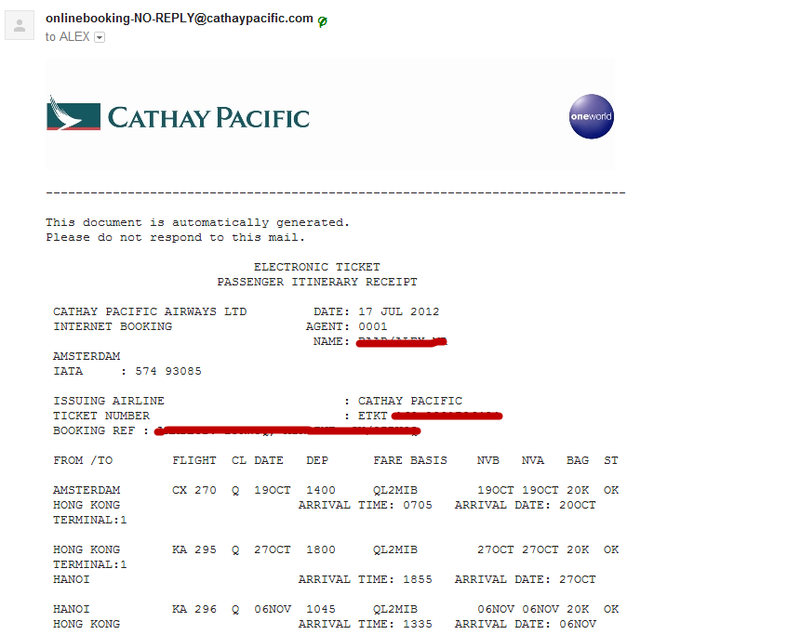 Cathay Pacific does not even bother how the email looks like, and they also do not try to sell me anything or communicate anything other then just the minimum of information I need. 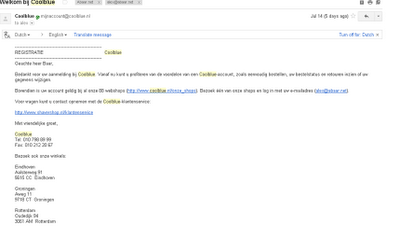 I did not made a screenshot from the entire e-mail because I had to scroll for about 5 minutes to get to the bottom. Not much has changed by the way. Deal Extreme has something strange. When you placed an order and paid by credit card, you receive a lot of e-mails. One of them is that you have to confirm your payment. 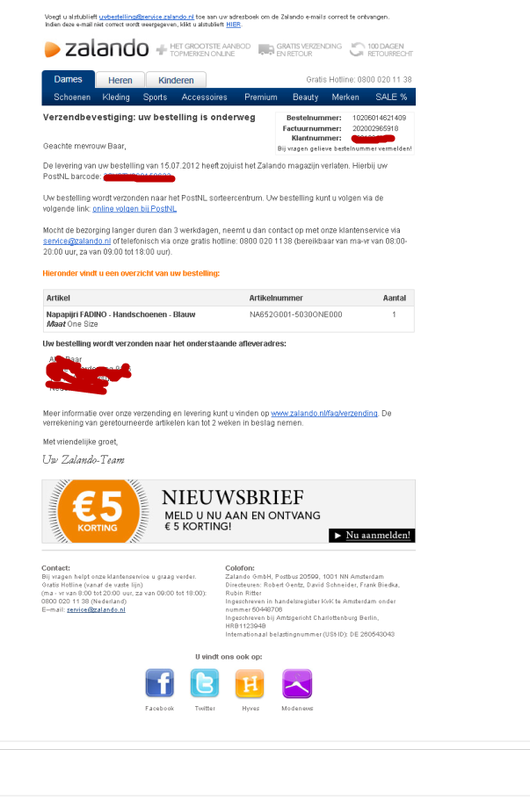 This is probably a secure process, but since it is not common, and I receive 3 or 4 mails after placing an order, this e-mail might be unread and or is unclear for the receivers. 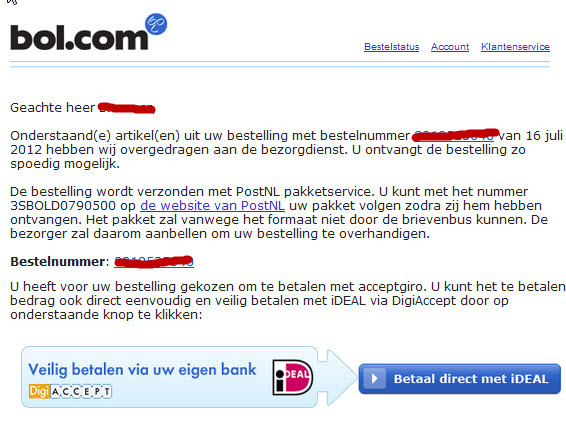 I already typed my CC numbers during the checkout process and in the e-mail is written about paypal. Very confusing.